I used to spend many wonderful moments in U Zavěšenýho Kafe a few years ago. Right at the foot of the hill near to the main tourist artery in Prague, Nerudova Street, it’s a stylish cafe with an unusual habit – but more about that later. I think you might appreciate the cafe after climbing up to the castle and wandering around Novy Svet (check the Novy Svet article). This cafe is also my recommendation, especially if the tourist trap cafes with low spirits are not tempting for you. During the week, the chef prepares lunch specials for great prices (from 12:00 – 14:00). Apart from lunchtime you have a wide choice of nice meals. On tap there’s Czech beer and wine and the variety of coffee and drinks on the menu should satisfy almost anyone. Since we’re mentioning the coffee, I must reveal the unusual habit of this cafe…or better not. It is a really precious habit and maybe it is better if you find out for yourselves. A hint: you can get a cup of coffee even if you are broke… but you can also provide a coffee for a person in need. 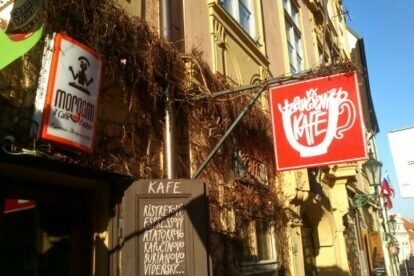 U Zavesenyho Kafe has a concept which is comforting and easygoing. Drop in anytime and relax. If you do like this cafe, buy a T-shirt to support it. Check the walls in the inner garden and send your photo from home, wherever it is. Next time you might find your smiling picture there also.